This is an old requirement for covered establishments. There are many companies that are exempt from this requirement, but we strongly urge you to maintain these records of injuries and illnesses. We also advise you to post the OSHA 300A form in a visible location as a method of educating your employees about the safety of their work environment. It is reassuring to employees to see this form with all zeros so that they understand it’s a safe place to work. HR Synergy, LLC and The Occupational Safety and Health Administration shares with you the goal of preventing injuries and illnesses in your workplace. Accurate injury and illness records will help achieve that goal. 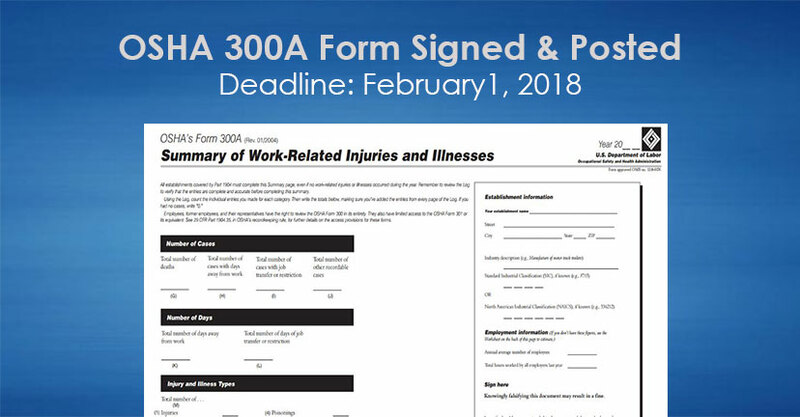 Visit OSHA.gov for more information and to download your 300A forms. Please contact us at (603) 641-2402 if you have any questions or concerns.